With over 100 essential oils on the market, dōTERRA sources its oils from 40 countries. Of those countries, 23 are developing countries that do not enjoy many of the basic amenities that we so often take for granted. In these cases, and in many cases in developed countries, dōTERRA’s need for essential oils is elevating communities out of poverty and desperate need. This initiative is called Co-Impact Sourcing. dōTERRA is committed to providing only the highest quality essential oils to every household throughout the world. Accomplishing such a goal requires extensive research to identify the best sources of these oils. There are complexities and nuances that affect the quality of an oil produced by the plant. Identifying the specific genus and species must be coupled with also identifying the best soil and environment to grow that plant, the best part of the plant and the best time to harvest, and the most effective means of distilling the oil from the plant. Once the specific plant and the proper environment have been identified, doTERRA goes to work finding the experts who have built their lives around those plants—many of whom have been doing so for generations. That expertise is irreplaceable, and sets dōTERRA products apart from every other product out there. Co-Impact Sourcing is so much more than just getting oils. Rather, Co-Impact Sourcing develops long-term, mutually beneficial partnerships. Through Co-Impact Sourcing, dōTERRA helps to provide the resources and education needed to improve the economy—and even sometimes create an economy—in these communities. Jobs are created as the need for an essential oil is met. Additionally, farming and distilling equipment as well as training are also provided. Additionally, farmers and distillers enter into agreements that assure them of fair and timely pay that they can rely on. But that’s not all. dōTERRA’s non-profit, charitable organisation, the Healing Hands Foundation™, also plays a role in Co-Impact Sourcing. The Healing Hands Foundation steps in to help the rest of the community, providing education, building schools, and working to provide the necessities of life, such as portable water and needed infrastructure. This commitment to not only source the highest quality essential oils but to also improve the lives of the communities results in a great deal of trust. As dōTERRA has grown, that trust has resulted in many essential oil cooperatives entering into exclusive agreements with dōTERRA. Word has also spread, and many more farmers and distillers are beginning to reach out to dōTERRA to enter into their own agreements. Throughout it all, dōTERRA’s commitment has remained the same—changing lives throughout the world with the precious gift of essential oils. 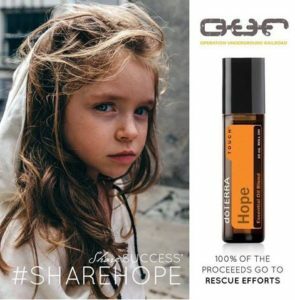 The doTERRA Healing Hands Foundation partners with other charitable organizations to offer hope to millions around the world. How do we contribute to making a difference? dōTERRA donates the total cost of this beautiful lotion, including the costs of packaging and distribution to the Healing Hands Foundation. This beautiful lotion contains precious Bulgarian Rose oil that is otherwise unavailable to purchase (although it is available as an incentive once a year). Operation Underground Railroad is an anti-child trafficking initiative seeking to bring an end to child slavery.